DETROIT — Supporters of the North American Free Trade Agreement see time as their best friend. Trump administration officials originally intended to rewrite the 23-year-old agreement with Mexico and Canada in a mere five months. The business community was also in favor of a quick negotiation that would focus on achievable aims and not devolve into political theater. But the schedule has already been pushed back as negotiations bog down over contentious U.S. proposals on issues such as rules of origin. Now, as fears increase that President Donald Trump may fulfill his threat to pull out of NAFTA, the business community is looking to prolong the process even more, like a losing football team scrambling to kick its way into overtime. 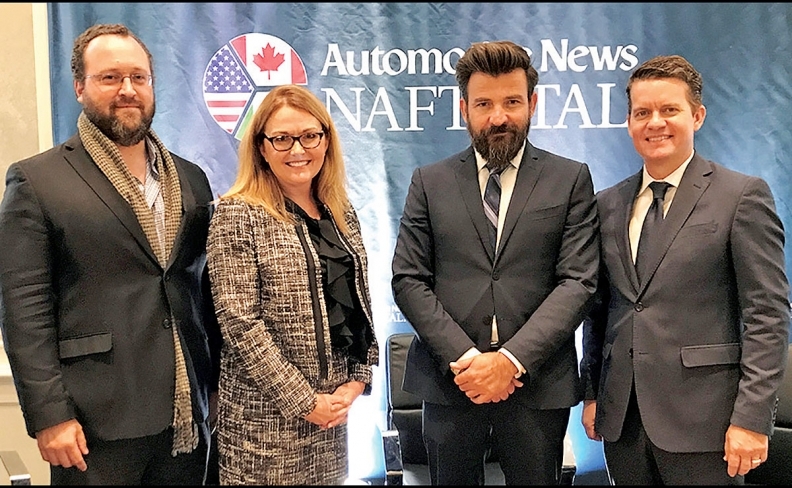 "We need to buy ourselves more time," Kellie Meiman, a managing partner at government affairs consultancy McLarty Associates in Washington, told representatives of auto suppliers at an Automotive News forum here. "We need to build up that fact-based public support for the agreement." Meiman, a former U.S. trade negotiator, expressed hope that Canada and Mexico would offer counterproposals during the coming round of talks, even if they are pro forma, just to keep the process from derailing. Business interests have mostly given up trying to convince Trump administration officials about the need to preserve NAFTA, with some modest fixes and updates. The last round of negotiations outside Washington ended in acrimony Oct. 13 over hard-line U.S. proposals and accusations from Canadian and Mexican officials that the U.S. was pushing an America-first agenda. Some analysts saw the proposals as an attempt to force Mexico and Canada from the table, giving Trump the pretext to withdraw from NAFTA. U.S. negotiators had set a late December deadline for finishing talks to avoid clashing with the 2018 Mexican presidential campaign and U.S. midterm congressional elections, when making compromises could be difficult. The White House also is looking for a win it can trumpet to its political base. But amid negotiating conflicts, the official start of the next round in Mexico City was pushed back to Friday, Nov. 17, and subsequent rounds will extend into the first quarter of next year. That is good news, industry representatives following the talks say, because it gives them more time to forge pro-NAFTA coalitions. Duncan Wood, director of the Mexico Institute at the Wilson Center in Washington, said in an interview that the best outcome would be for all sides to postpone further talks until after the elections. Even if the U.S. reached an agreement by early 2018, getting it through Congress would be complicated in an election season, he said. A delay is "actually a good option," he said, "because we don't have to change anything then, and we wait until a new election cycle begins, and hopefully it's beyond 2020." Yet Wood doubts that Trump will be so patient. "Trump has said over and over again that NAFTA is the worst trade deal ever signed by the U.S.," he said, "so if he doesn't take this opportunity to terminate, then he's going to look weak." Any decision to exit NAFTA would be followed by a six-month waiting period, which Meiman said would be used by stakeholders to get talks back on track or build obstacles to terminating its provisions. "If withdrawal is triggered, there is going to be a big fight," Meiman said. "Already people are planning for what path can be taken if the administration decides to withdraw." NAFTA defenders in the private sector see Congress as their best line of defense, given that NAFTA's provisions touch varied constituencies, from heavy manufacturing to technology to agriculture. Congress has constitutionally granted authority over foreign trade, though it ceded some powers to the executive branch under the 1974 Trade Act. Lawyers are split on whether the president would need congressional approval to quit NAFTA, though many believe only Congress has the power to unwind U.S. laws passed to implement the pact. Meiman said it's unlikely Congress would modify the Trade Act to take back withdrawal authority from the executive branch because it would require a veto-proof majority, but business groups are studying the possibility of inserting language in the law that would require a study by the International Trade Commission or consultation with Congress "as a check that would buy us more time to get better organized and also put some new data on the table." Stakeholders also are considering mounting a constitutional challenge asserting Congress' ultimate authority over trade, Meiman said. With Congress focused on tax reform, stalling the process will give the pro-NAFTA side more political space to have substantive debates and win public support for reasonable reforms to the deal, she said. "This political moment is so challenging," Meiman said. "We need time for all the private sector to get better organized and aligned."